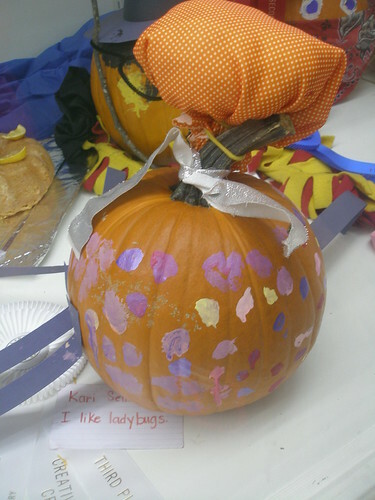 Confessions of an ADD English Teacher: Fun At the Fair...pumpkins! We've been crazy busy at our house with the fair. Yesterday was the best day so far. The kids had the day off from school and were entered in several contests. We ended up with three very happy children and one rather sad one. But, that happens sometimes. We're trying to show him what he is good at...like useless trivia...I'll get to that a bit further down. Ben also competed in the "wee ones." 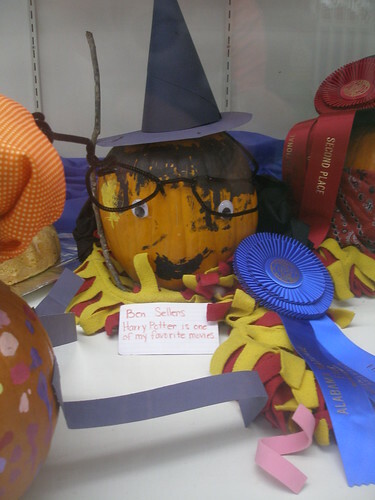 He spent a lot of time decorating Harry Potter. He won first place! Some of the paint got smeared in the transport to the display window. Leelee was in the older kids division. 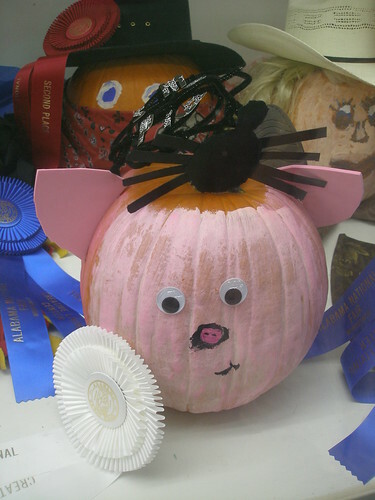 She made Wilbur and attached to the top is Charlotte and her web with the words "some pig." She took third place! I kept telling the kids how important it was to just have fun. It's not about the ribbons or the prizes, it's the memories and the fun. Hopefully the message sinks in. That evening we did the Great American Spam Cookoff competition. I'll write on that tomorrow. We're taking a break from competitions today and tomorrow, it's Pie Day at the Fair. I'm entering Nutella Banana Pie. If I don't win, I can share the recipe with you all...so I guess you better hope you don't see the recipe posted hahaha. We'll only be posting *one* of our two Spam recipes. :) Too bad you are stuck with only the losing recipes!